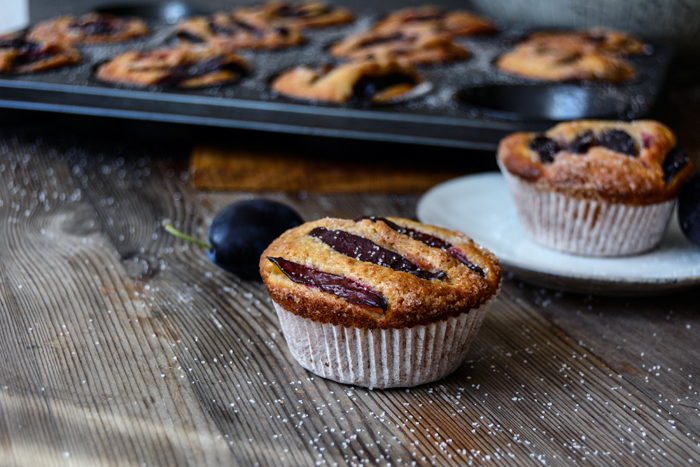 More plums and more muffins! On Wednesday, I mentioned my unstoppable appetite for plums. I turned the sweet and sour fruit into a caramelized topping for a rich cheese omelette and made a heavenly ciabatta sandwich. 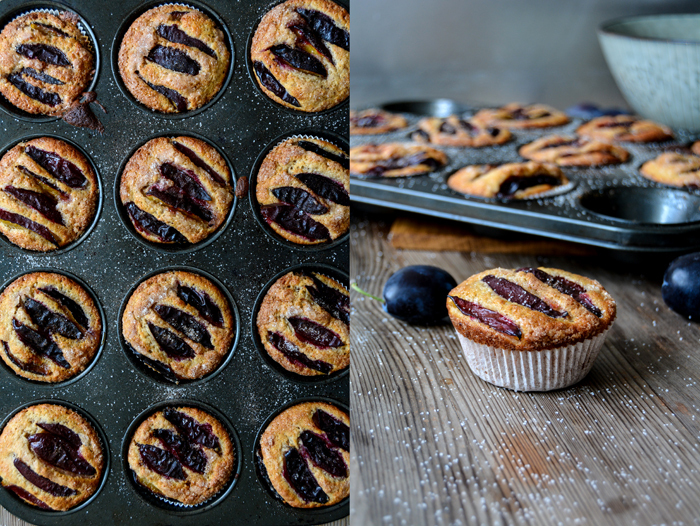 Today I turned them into muffins, fluffy muffins, refined with lots of cinnamon and pretty plums on top. 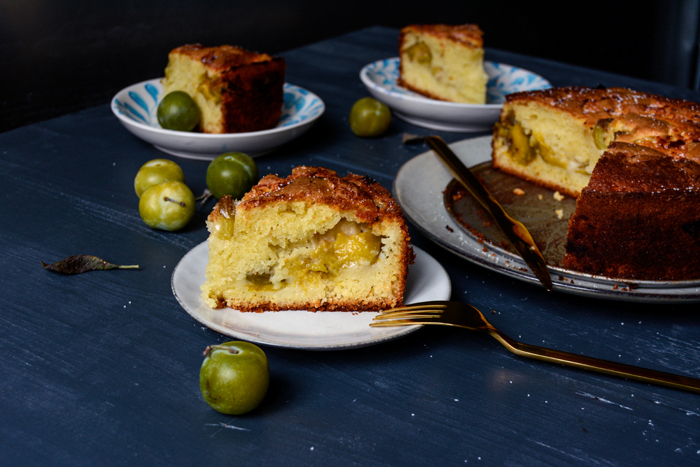 I need my sweet dose of homemade cake at least once a week and there’s no better day to indulge in this treat than on a Sunday. 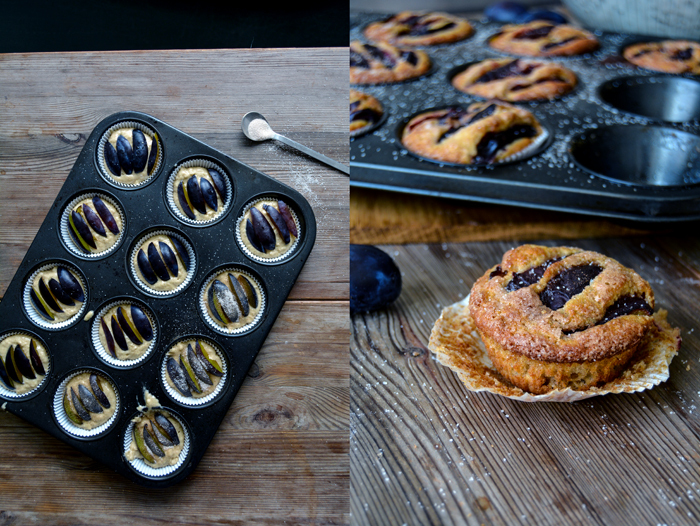 And if I don’t have much time, I go for muffins. 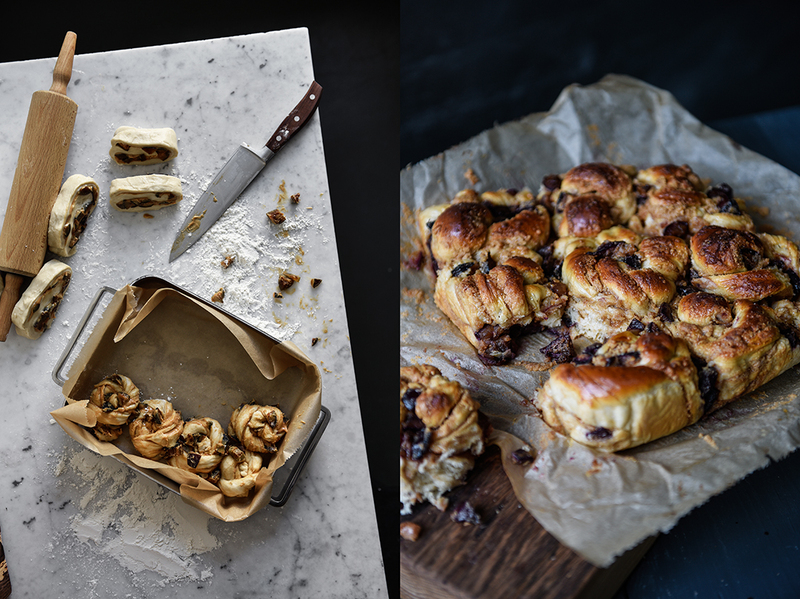 A batch of 12 is just enough for the two of us for breakfast and tea time, and the last nibbles are reserved for dessert. 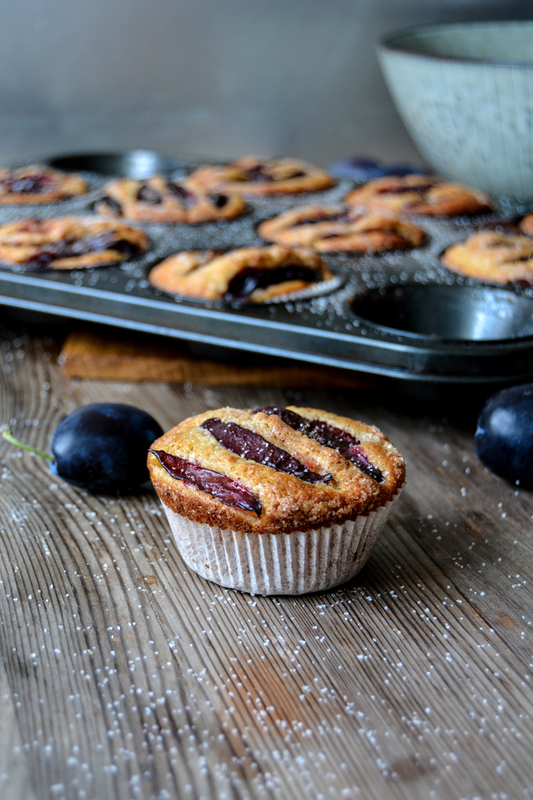 I like to use German plums for baking, also known as Damson plums, but feel free to use Italian plums or any variety you can find. Apples, pears, or blueberry work just as well, I’d even give some late summer peaches or figs a go. 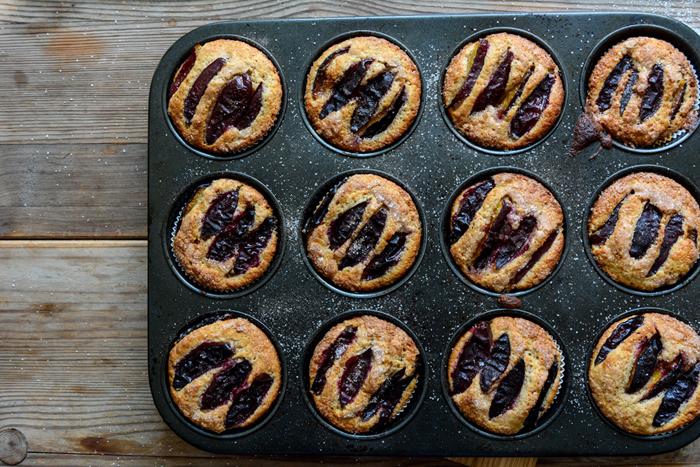 Set the oven to 200°C / 400°F (preferably convection setting) and line the 12 molds of a muffin tray with paper baking cups. 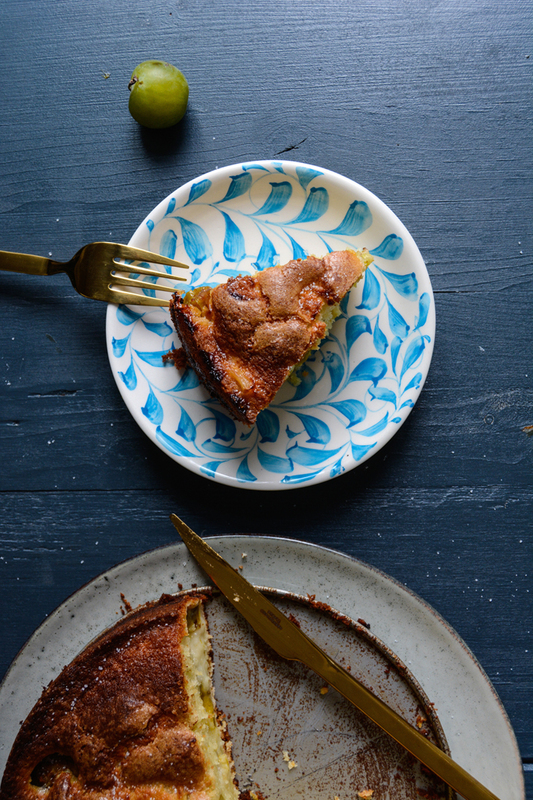 In a large bowl, whisk the buttermilk, melted butter, buttermilk, and egg, then pour into the flour mixture. Using a wooden spoon, stir until you have a lumpy dough, with a bit of flour left here and there. Keep in mind, the more you mix it, the more it will lose its light texture. 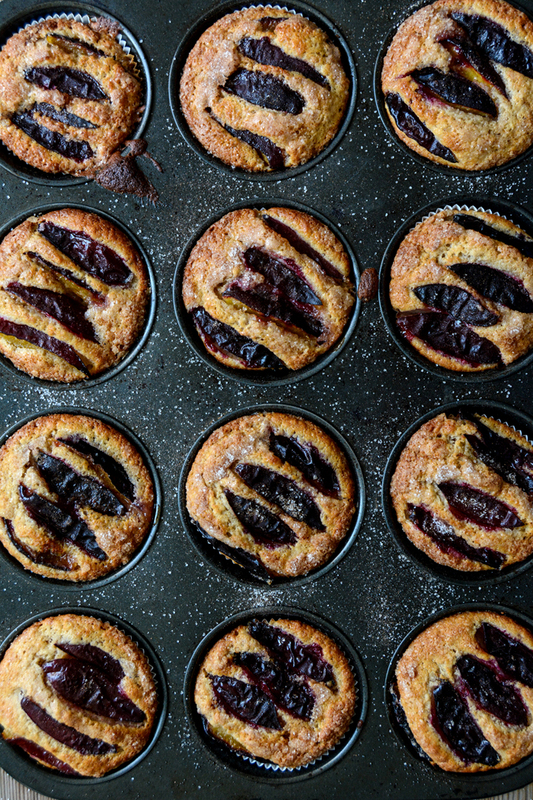 Divide the dough between the muffin cups and arrange the plum wedges on top. 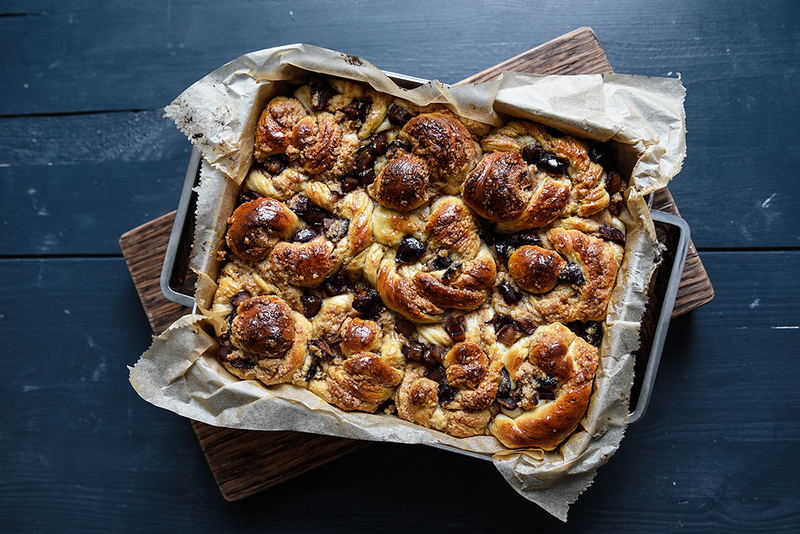 For the topping, sprinkle with the cinnamon sugar and bake for about 15 minutes (slightly longer if using a conventional oven) or until the muffins are golden and firm on top. Let them cool for 1-2 minutes before you take them out of the tray. Somewhere in the snowy mountains in northern Italy, is a tiny village that you can only reach through a dangerously narrow road. Winding up higher and higher, dark fir trees on one side and deep gorges on the other, it makes you pray with gratitude once you get to the village safely. I used to spend a lot of time there, skiing and walking through the woods, through knee-deep snow until I reached one of the cosy wooden huts that are luckily spread all over to offer the frozen wanderer a bit of warmth, rest, and food. 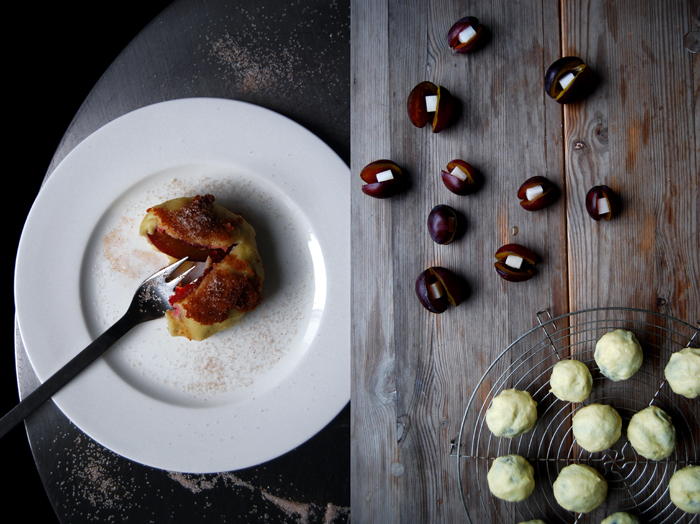 The culinary treasures of this region – in South Tyrol – are outstanding and one of the best things you can give your body when the temperatures are freezing. 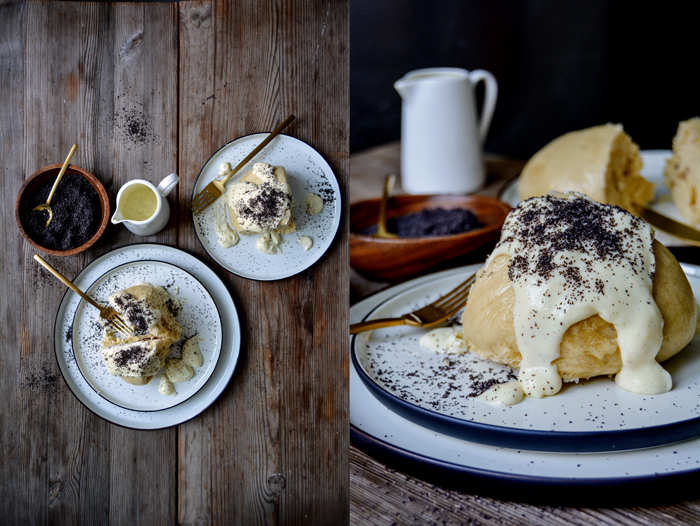 One of these treats actually originated in Austria but crossed the border and became a staple in the local cooking: wonderfully fluffy Germknödel. 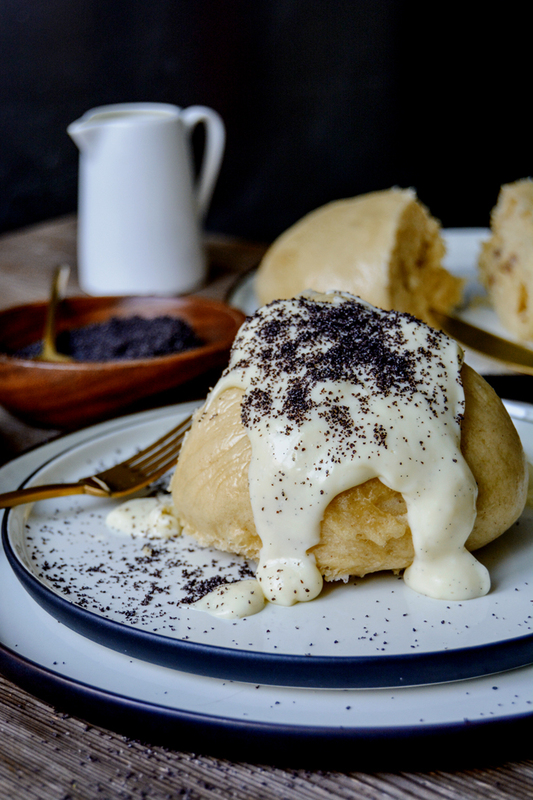 It’s a yeast dough dumpling, usually filled with plum butter (thick and sticky plum jam) and topped with melted butter, poppy seeds, and icing sugar. 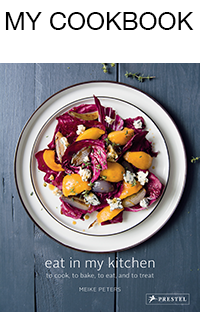 It’s one of those dishes that you can easily eat for breakfast, lunch, and dinner. I used to enjoy it so often on the terrace of a very old hut, it had a breathtaking view over icy-white mountains, often framed in a sparkling blue sky. The chef used to serve it with thick vanilla custard instead of the melted butter and that’s what I do in my kitchen as well. 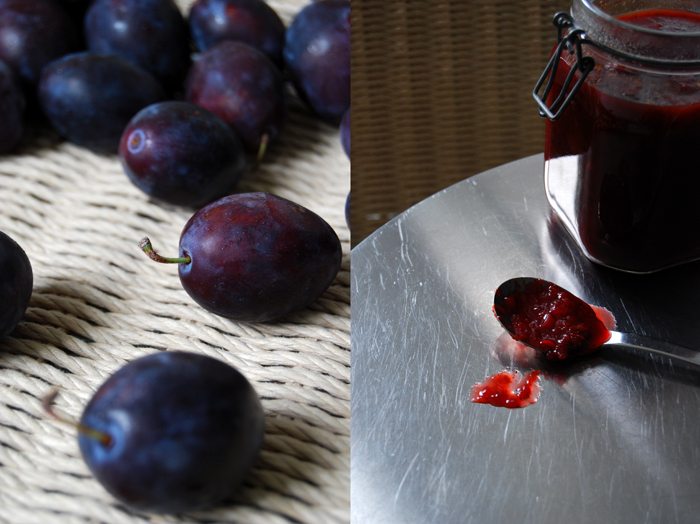 I also replace the plum jam with whole plums for a bit more fruitiness. The only difficult task I had to solve, was to decide how I would steam the dumplings (I don’t have a steam cooker in my kitchen). You could also blanch them in water but the results aren’t as nice. A quick phone call with my mother and my problem was solved. 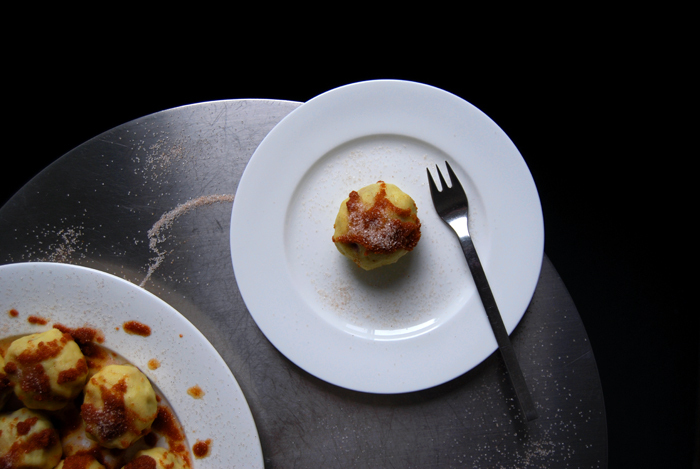 I did it the way my granny Lisa used to cook dumplings: on a cotton tea towel tightened with clothespins over a wide pot filled with simmering water – old-fashioned, cheap, and my Knödel were perfect. I could have steamed them one after the other to give them a pretty round shape, but I was impatient. I cooked all at once, up against each other, and broke their fluffiness apart when they were done. Warm, tender, and fragrant, you don’t want to eat anything else ever again. To steam the dumplings, you need a large, wide pot (mine is 24cm / 9 1/2″ wide), a cotton or linen tea towel plus 4 clothespins to fix the towel, and a metal (or heat-resistant) bowl, large enough to cover the pot as a domed lid. For the dumplings, combine the flour, sugar, cinnamon, yeast, and salt in a large bowl. Whisk together the milk, butter, and the egg – the mixture should be lukewarm. Add to the dry mixture and mix with the dough hooks of an electric mixer for a few minutes or until well combined. 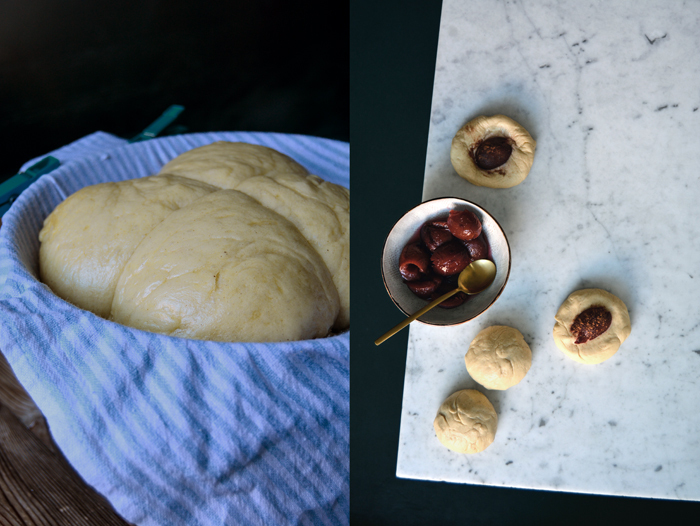 Continue kneading with your hands for a few minutes until you have a soft and silky dough ball. Place the dough back in the bowl, cover with a tea towel, and let rise in a warm place, or preferably in a 35°C / 100°F warm oven, for about 70 minutes or until doubled in size. Punch the dough down, take it out of the bowl, and knead for about 30 seconds. Divide the dough into 4 equal portions and use your hands to form each one into a 10cm / 4″ disc. Lay 1 plum half in the middle of each dough disc and sprinkle with a little cinnamon. 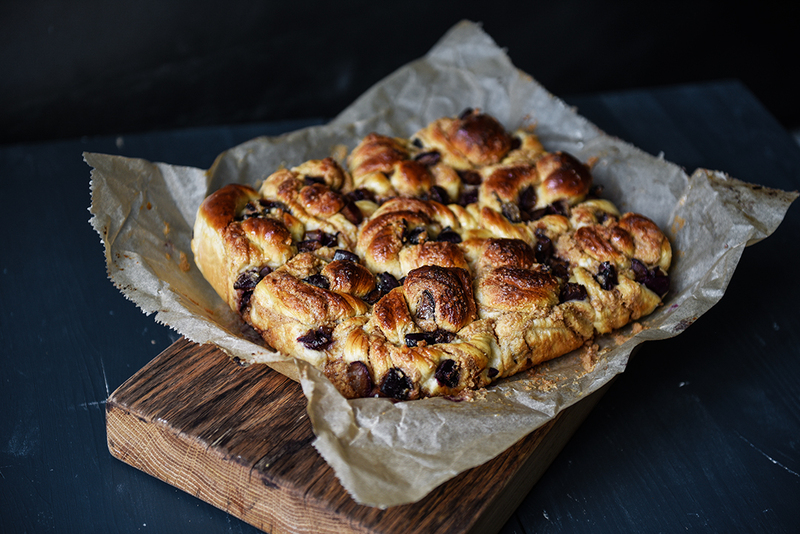 Fold the dough up and use your fingers to squeeze the dough together to close the dumplings and seal the plums tightly inside. Roll into balls with your hands and transfer the dumplings to a lightly floured baking dish or baking sheet. Cover with a tea towel and let rise in a warm place for about 20 minutes until puffy. While the dumplings are rising, fill about 1/3 of the pot with water and bring to the boil. Take the pot off the heat and lay a cotton or linen tea towel over the pot (mind the hot steam). Fix the towel with clothespins at the handles so that the towel can hang in the pot without touching the water. Lay the dumplings – 4 at once or in batches, if you want to have round shaped single dumplings – onto the towel, they shouldn’t touch the water. Cover with a tight fitting metal bowl (upside down) and transfer the pot back to the heat. Turn the heat down to a low simmer (medium to medium-low) and steam the dumplings for 20 minutes without lifting the top (!). While the dumplings are cooking, make the custard: In a small bowl, whisk 4 tablespoons of the milk with the egg yolks, sugar, cornstarch, and salt until well combined. In a medium saucepan, bring the remaining milk and the vanilla pod to the boil. Take the vanilla out and scrape the seeds from the pod into the milk. Whisking constantly, add the egg yolk mixture to the hot milk and bring to a boil. Take the saucepan off the heat; continue whisking for 2 minutes and set aside. After 20 minutes take the pot off the heat and the top off the dumplings – mind the hot steam. Carefully transfer the towel with the dumplings to a table, wait for about 2 minutes then use a knife to peel the dumplings off the towel. If you cooked all of them at once, break them into 4 pieces. 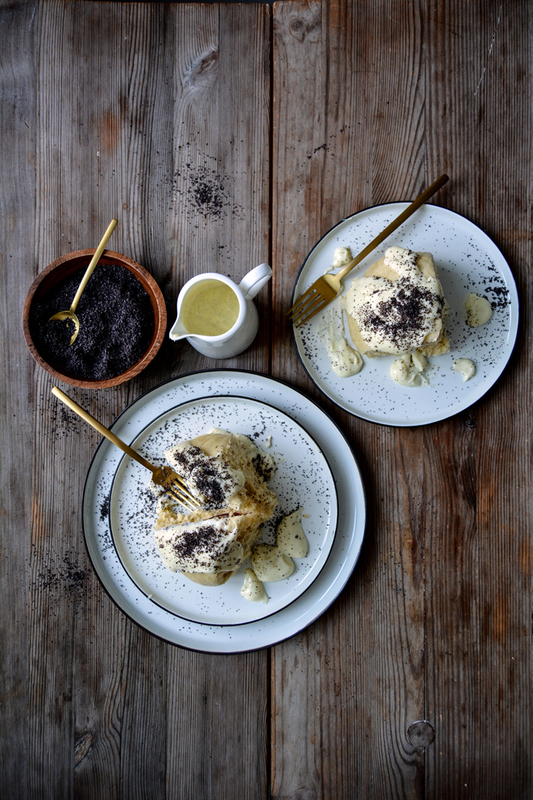 Serve immediately with the warm vanilla custard, sprinkled with poppy seeds. 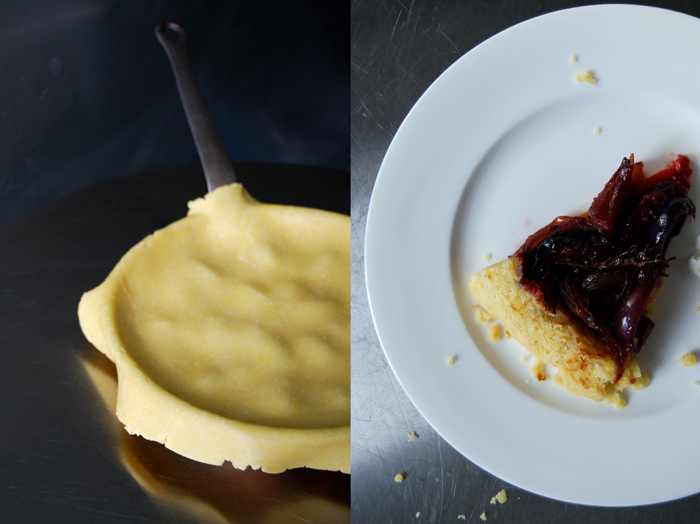 Plums, potato dough, browned breadcrumb butter, sugar and cinnamon – this southern German sweet doesn’t call for many ingredients but it puts them together in just the right way. 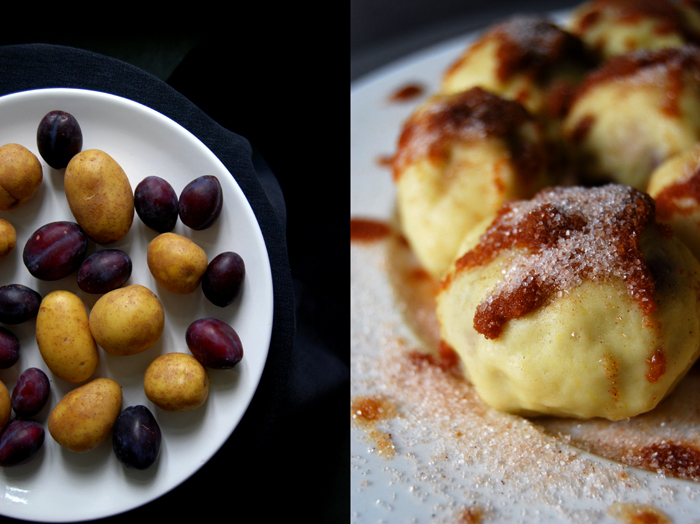 The result is heavenly: sweet plum dumplings with browned breadcrumb butter and cinnamon sugar – or in German – Zwetschgenknödel! 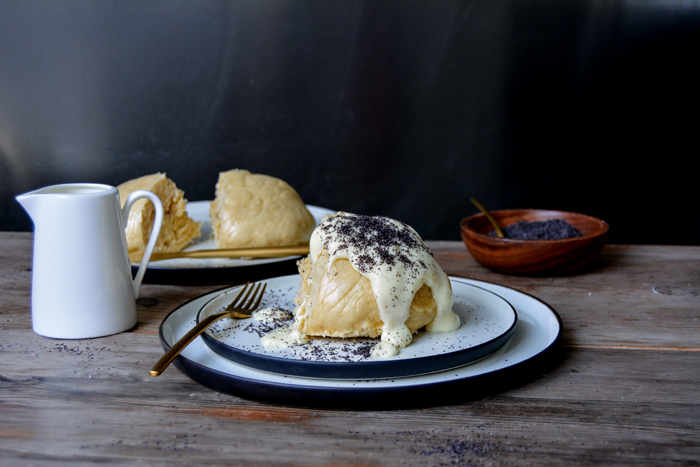 My versatile Gnocchi dough makes another appearance for this recipe. 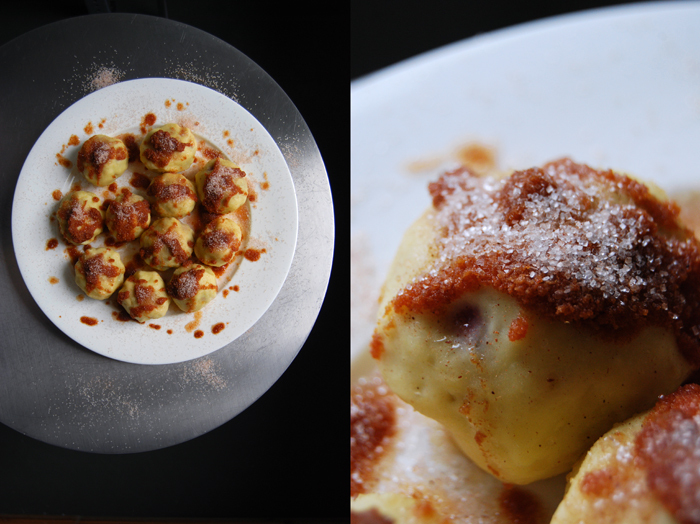 For Friday’s Bavarian beer roasted pork, I recommended savory potato dumplings with the same dough. 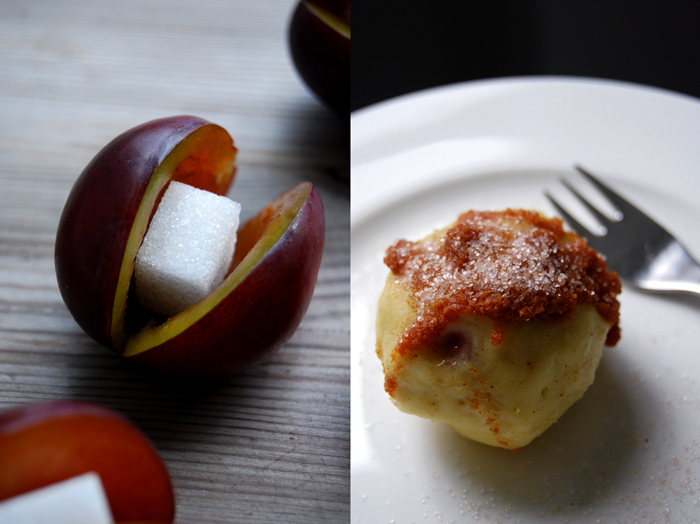 For this traditional Swabian dish, I use it to wrap sweet and sour plums with a thin layer of the potato mixture to turn the blue fruits into sweet, fruity dumplings. 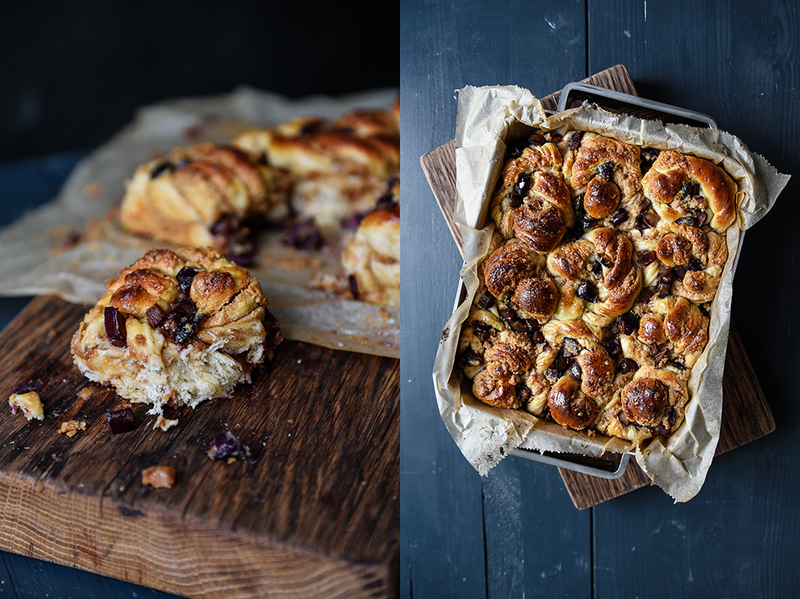 Whenever I make this recipe, I consider reducing the amount of butter and sugar for just a split second, but luckily I never do. 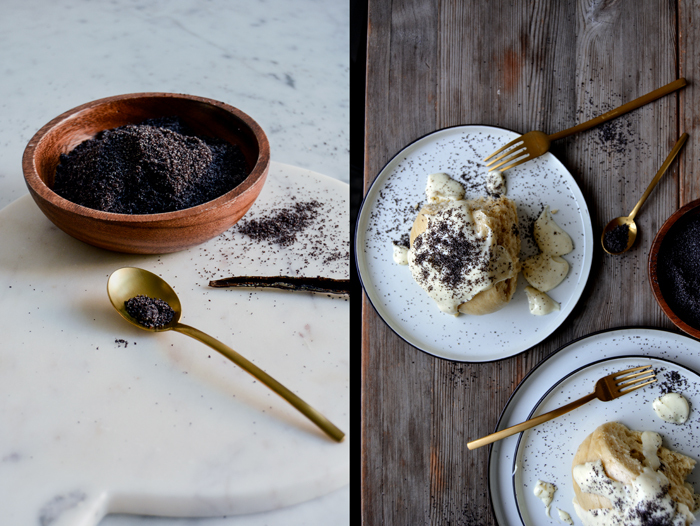 This dish really needs all the lusciousness of its decadent topping. 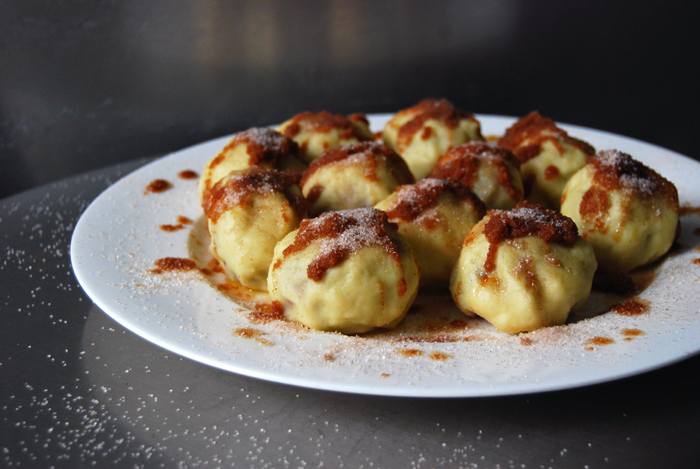 I learnt about these dumplings from my Swabian step father Uli and he taught me that a dessert is there to enjoy and not about counting calories. 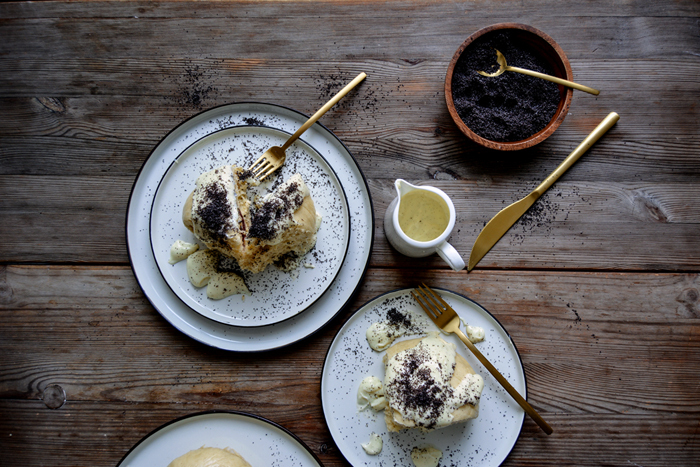 Every time we make the Knödel together in my mother’s kitchen, he reminds us to keep the potato dough layer very thin, that’s how he learnt to do it from his mother and grandmother. It’s our job to form the dumplings but it’s his to take care of the quality control, and he is a very picky instructor! 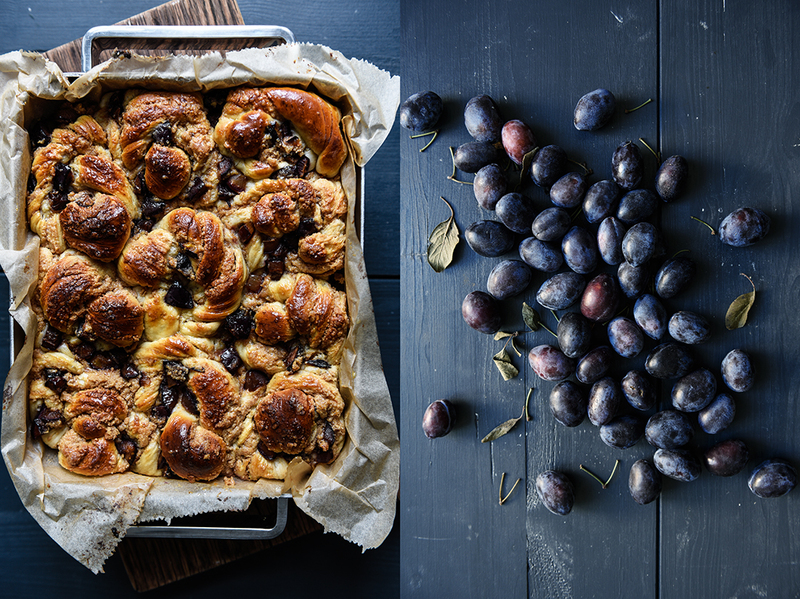 It can be a bit fiddly getting the little balls in shape, to make it a little bit easier you should use small plums like Damsons and keep your fingers moist while you’re working with the dough. 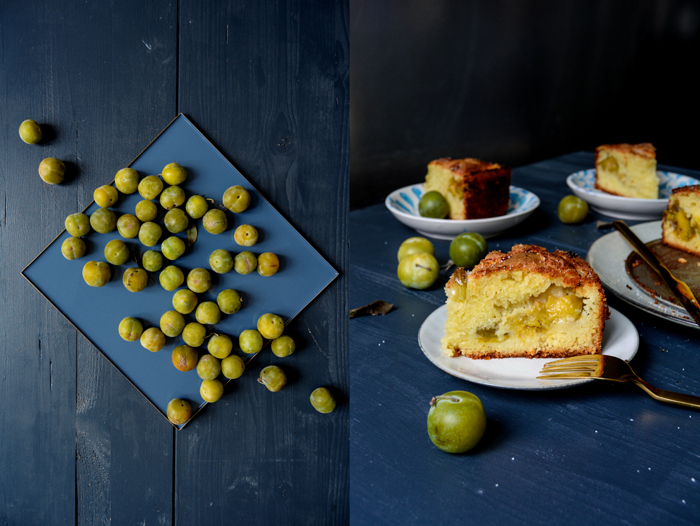 Cut the plums open on one side, take out the seed and fill each fruit with a sugar cube, close the fruit as well as possible. In a sauce pan, melt the butter with the breadcrumbs. Cook the mixture for a few minutes on medium-high temperature until golden brown. Don’t let it burn or it will taste bitter. Cook the the potatoes in salted water until soft (around 15 minutes), drain them when they are done. Press the drained, warm potatoes through a potato ricer and mix immediately with the butter and egg yolks. Let the mixture cool completely before you continue with the next step! With a spoon (or your hands), mix the cold potato mixture with the flour and salt until combined. Your fingers should be wet while you’re forming the dumplings, so keep a little bowl of water right next to you. In a large pot, bring lots of water with 1/2 teaspoon of salt to the boil. 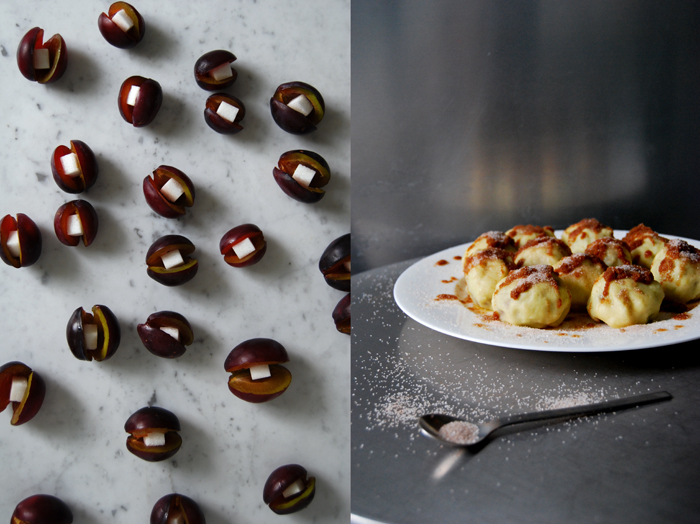 With a tablespoon, take a walnut sized ball of the potato dough. Shape a flat ball and lay it flat in the palm of your moistened hand, pushing down the middle with the thumb of your other hand. Lay the plum (cut side down) into the center of the dough and gently start pushing and rolling up the dough until the whole fruit is covered with a thin layer (the blue of the plums will be just visible in some places, see my second to last picture). If the dough starts tearing, take a little bit more to cover the fruits. Place the dumplings on a grid until you’re done with all of them (when you take the dumplings off the grid you might have to even out the grid’s mark with your fingers). Cook the dumplings in batches in the hot but not boiling water (simmering) for about 8-10 minutes or until they start to float on the surface. Take the dumplings out with a slotted ladle and let them drain on a grid for a few seconds. Put the cooked dumplings into a large bowl or onto a plate, pour over the warm browned breadcrumb butter and sprinkle the cinnamon sugar on top. I’m running out of time! 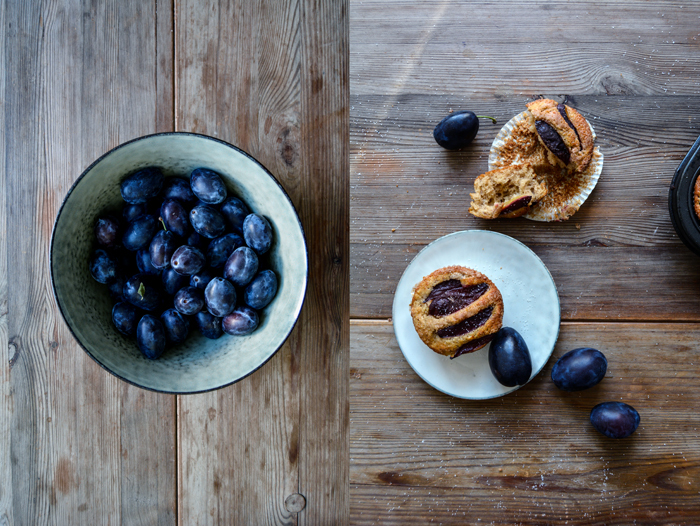 There are still so many plum recipes I want to write about but the local blue fruits are almost at the end of their season. 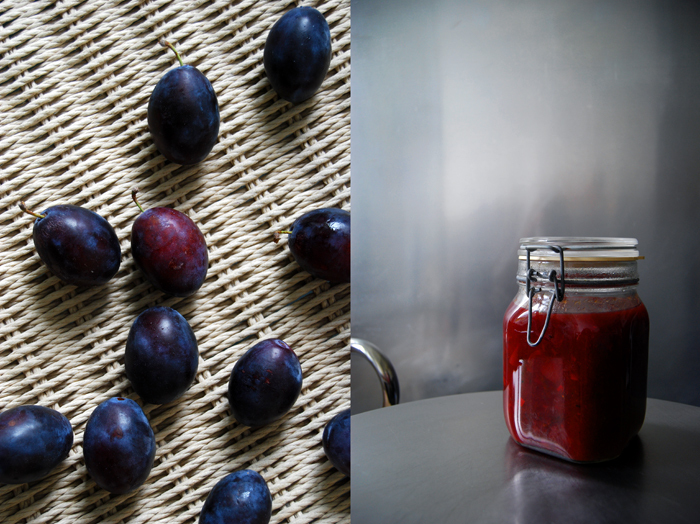 This recipe is one of my classic preserves, a spicy deep purple plum chutney. 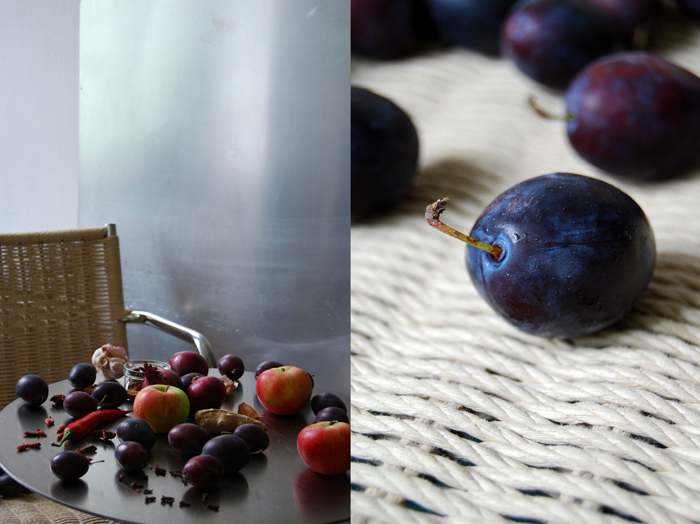 I prepare my chutneys all year round so that my pantry is always filled with plums, rhubarb and apples. I try a few others once in a while but these three are my standards, the ones that I can’t, or don’t want to, live without. 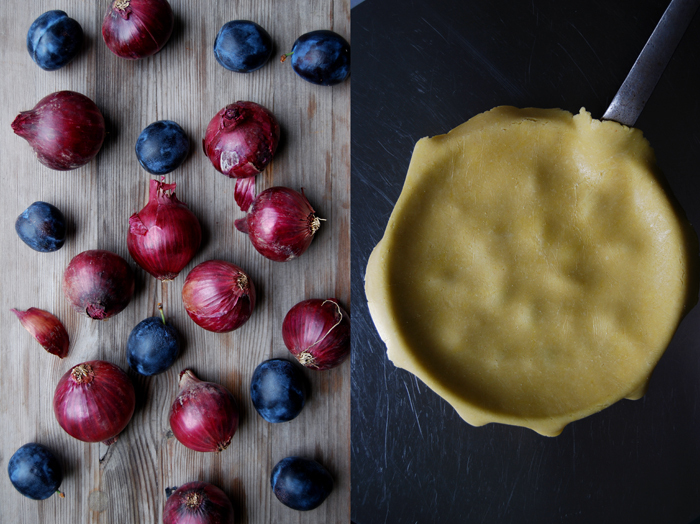 I have special combinations with each of them and the plum chutney is my favourite for cold roasts or hard mountain cheese. The one that I cook with apples is the strongest of all and it can take even the ripest French camembert! 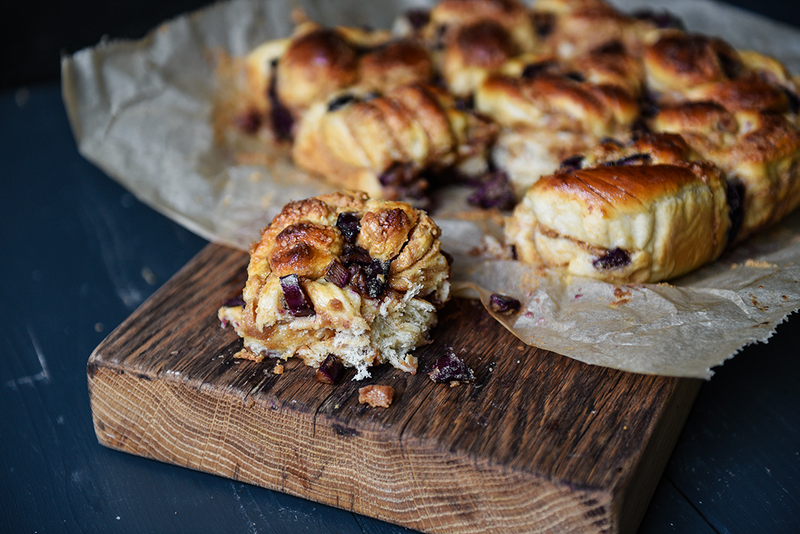 When I wrote about one of my early sandwiches, a hearty homemade mountain bun stuffed with ham, cheese and plum chutney, I got so many requests for this chutney. I felt a bit bad as I wrote about it in December not thinking that it would take another eight months for plums to be in season again. So here it is, get started and enjoy with whatever comes into your mind. 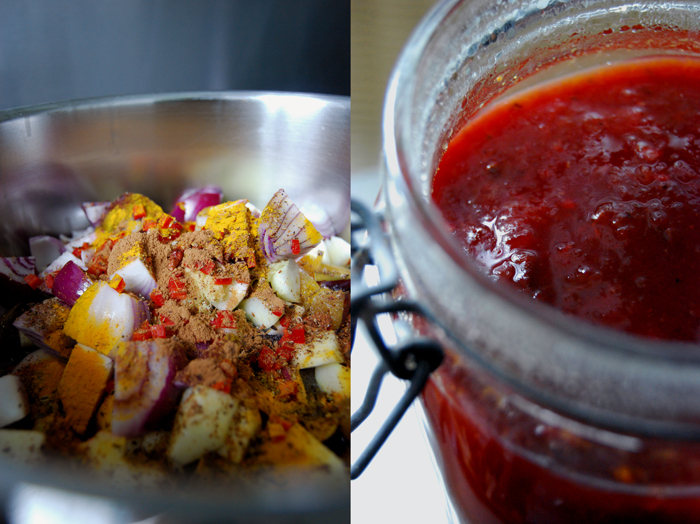 That’s great about chutneys, they taste so strong but they work so well in all kinds of unusual combinations! Sterilise the jars in boiling water for 5 minutes. In a large pot, bring all the ingredients to the boil. 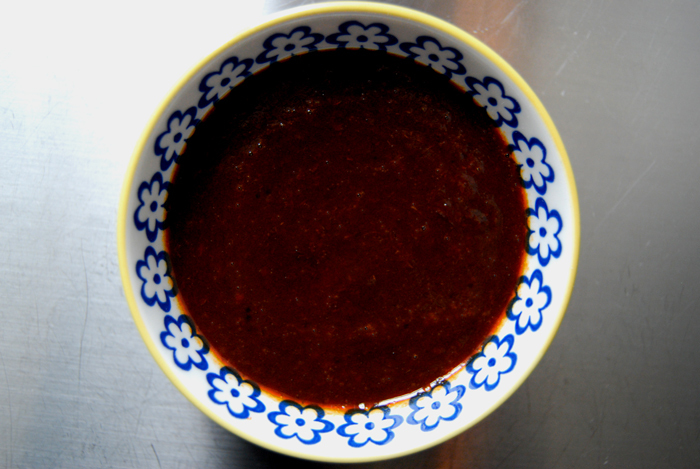 Cook the chutney (slightly bubbling) without a lid for about an hour on medium temperature until it thickens. After 30 minutes, check the spiciness, either take out the dried chilies or leave them in till the end if you prefer it more hot, but take them out before you fill the chutney into the jars. Dip the rim of the strilised jars in spirit and wash out the lids with the alcohol as well. Fill your jars with the chutney and close well immediately. You can eat the chutney right away but I prefer to let it sit for at least 3 weeks. 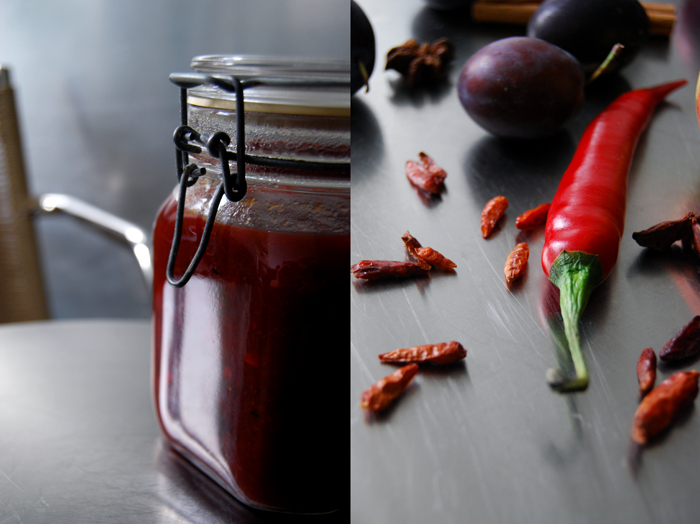 You should keep an open jar in the fridge (mine stays fresh for months) and the closed jars in your pantry. My Tart Tatin goes savory! 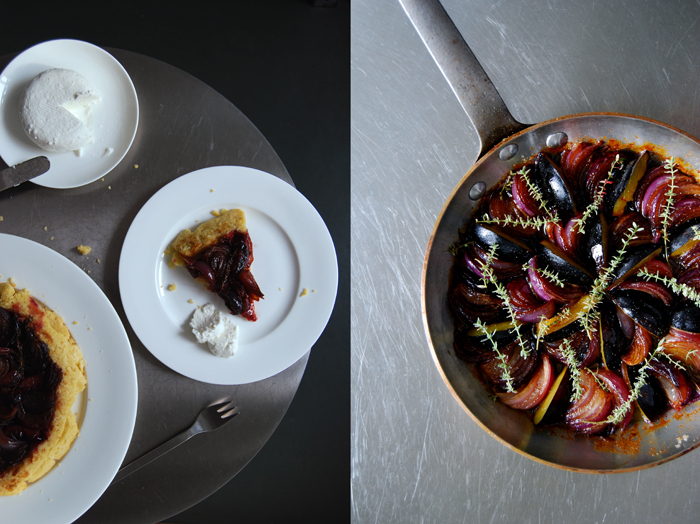 Caramelized red onions, sweet and sour plums, aromatic thyme and chèvre replace the apples which I usually choose for this tart, and it’s great. This is the taste of late summer! 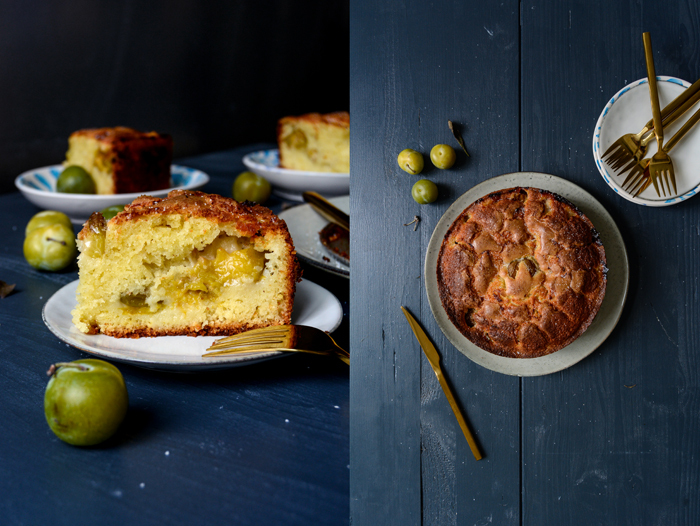 At the moment I can’t get enough of the combination of sweet, fruity and savory flavours. I’ve always been a big fan of it but I’m a bit obsessed with it right now (so much that my boyfriend already asked for a break). 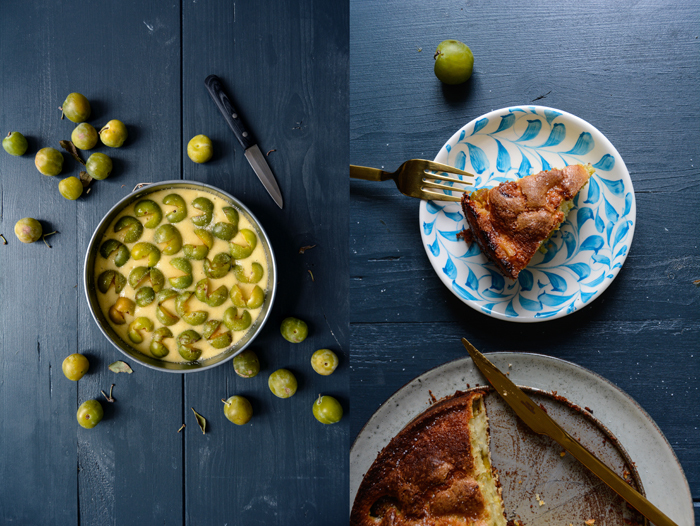 I mix mirabelles, plums, peaches, grapes or figs with saltimbocca, coarse sausages and chicken and I barely eat my cheese without one of my plum, rhubarb or apple chutneys (I will share my plum chutney recipe soon). I love August and September in northern Europe, the transition to autumn. 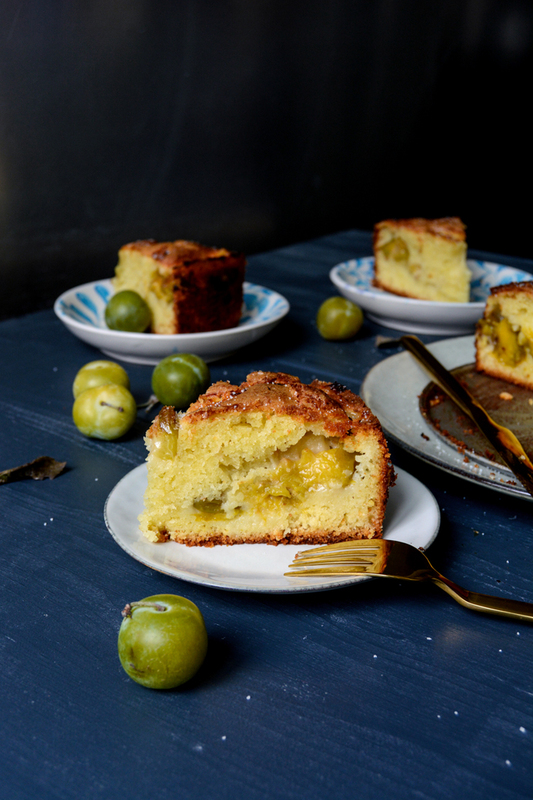 The light is magical and it’s the time to harvest all those wonderful fruits, to cook them and turn them into delicious dishes and colourful jams and chutneys for the colder months. That makes it so much easier to let go of summer! 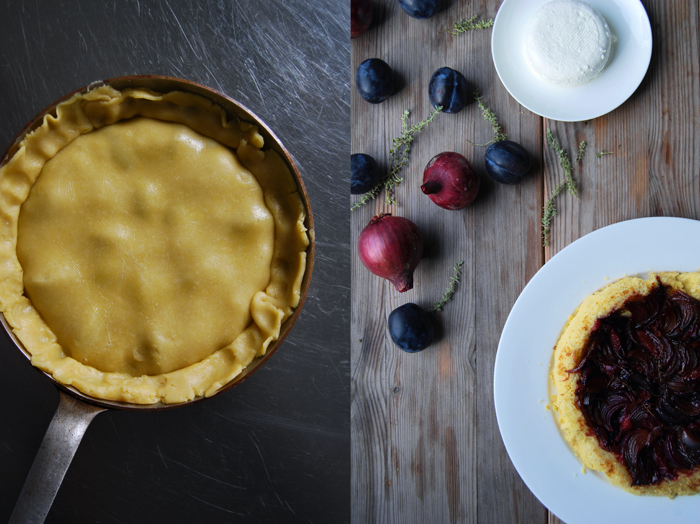 For the tarte you need a 21cm / 8″ Tarte Tatin dish or frying pan which is ovenproof. For the shortcrust, combine the flour and salt. Cut the butter with a knife into the flour until there are just little pieces of butter left. Continue with your fingers and quickly work the butter into the flour until combined. Add the egg yolk and the water, continue mixing with the hooks of your mixer until you have a crumbly mixture. Form a disc, wrap in cling film and put in the freezer for 10 minutes. In a pan (or Tarte Tatin dish), heat the butter with the sugar and oil until it starts to caramelize. Add the onions, arrange them in a circle and cook them for 7 minutes on medium heat. Turn them gently and cook them for another 7 minutes. Mind that they don’t burn, they should become golden brown. 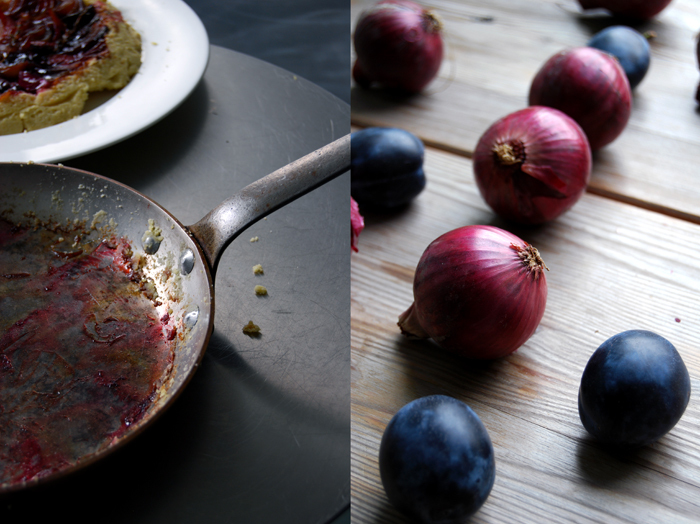 Tuck the plum wedges in between the onions and cook for 2 minutes. 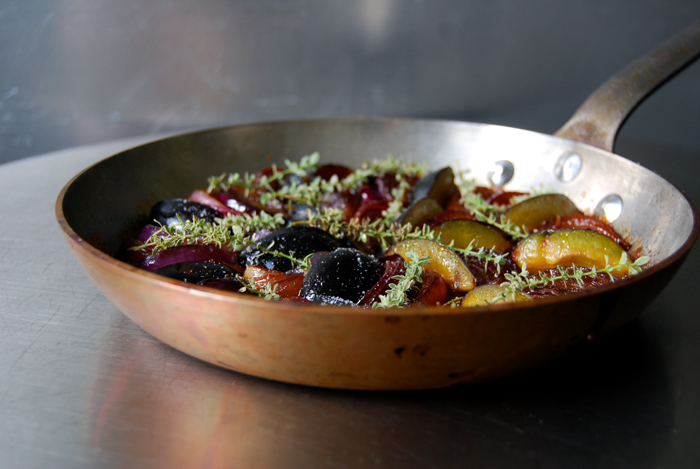 Take the pan off the heat and sprinkle with salt, pepper and thyme. Roll out the dough, big enough to cover the pan and lay it on top of the onions tucking the edges down the sides. Bake in the oven for 12 minutes or until golden brown. When the tarte is done, place a large heat resistant plate on top and turn the pan carefully upside down, keep in mind that it’s very hot! 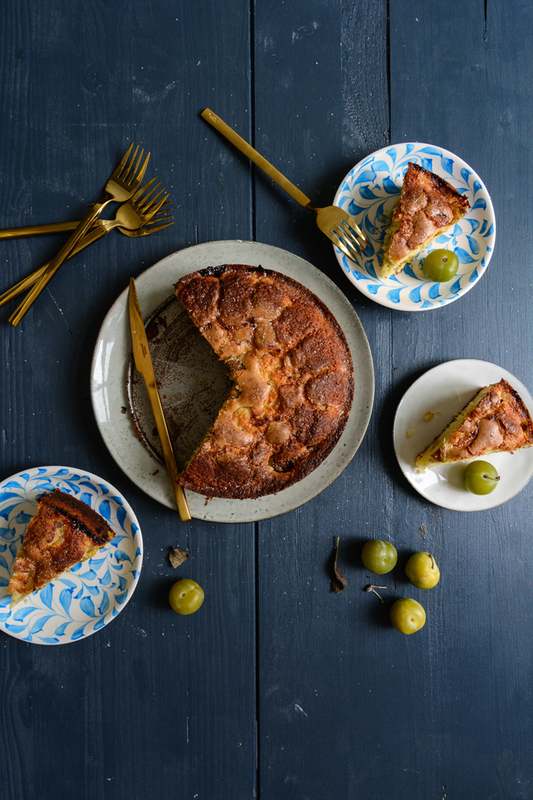 Serve the Tart Tatin with a big slice of chèvre. As a child I loved oats with cocoa powder and milk – the famous porridge. I loved it so much that I had to have a bowl of this every day and I think that was the beginning of my love for food which I had prepared myself. It might sound like a rather simple start to the culinary wonders of life. But I must have been around 5 years old when I cultivated this daily routine of going to the kitchen, preparing my bowl with oats, unsweetened dark cocoa powder, sugar and fresh milk. Always in the same bowl. 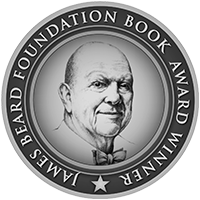 It felt like a very special treat for myself, a pure moment of pleasure, eating with relish. 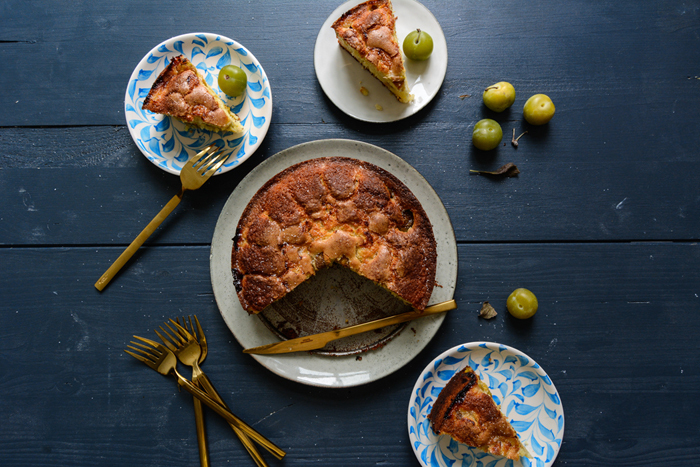 This intuitive routine which I created just for myself made me realise that I need these recurring moments of simple pleasure and enjoyment – a treat, just me and my food. This never changed, my approach to food is still totally intuitive. Since those days I discovered so much (I don’t concentrate on oats anymore) but I still feel the same satisfaction in the happy moments with my food, every day. This morning I found a bag with puréed plums in my freezer which I had prepared originally for spontaneous ice cream ideas in winter (it makes such a wonderful ice cream when mixed with yoghurt). It was a very cold morning and I felt a bit nostalgic. I needed a bowl of steaming porridge and decided to sweeten it with my (warmed up) freezer-discovery. 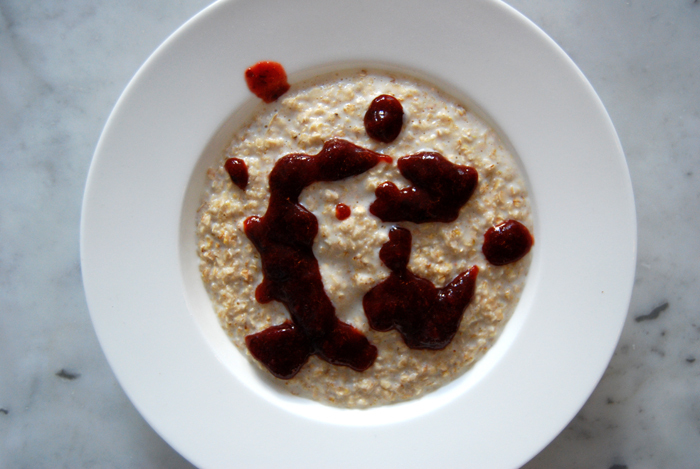 I took out a pan, cooked a bowl of oats together with milk until it bubbled and poured the warm plum sauce on top. 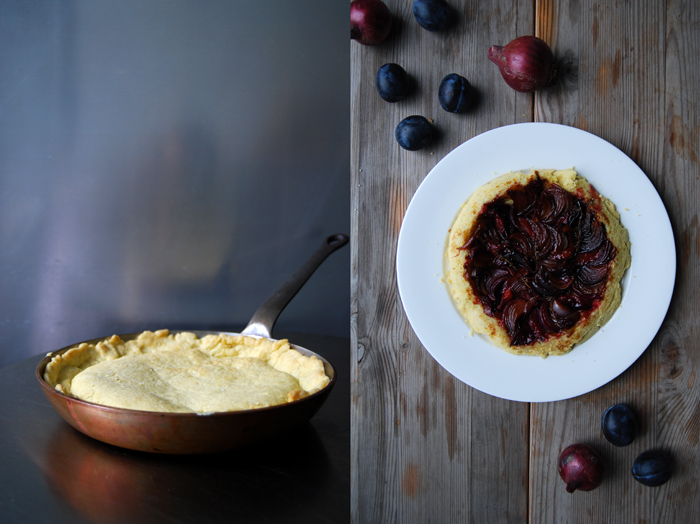 I had made the plum purée from 300g / 10.5 ounces of plums mixed with a few tablespoons of sugar and some cinnamon.